Use as a first course or in place of the salad course. This recipe will give enough sauce for 4-6 portions. The recipe can be doubled without a problem. This is a classic sauce for early thin asparagus that I really enjoy. Although steamed or poached asparagus are great with a little vinaigrette, this however really turns them into something very elegant. I have added some more serving suggestions in my notes below. You will need my Hollandaise Sauce recipe just click on the link. I also have some general guide lines for cooking and buy asparagus on my Everything About Asparagus. Asparagus with Hollandaise - You will need 6 to 7 stalks of medium thick asparagus spears or 10 pencil thin spears for each person. This is for a very nice first course. This part of the recipe only takes about 15 minutes. See my notes below for lots of extra information. 1 Hollandaise recipe see above. Peel the asparagus bottoms to remove the tough outer stringy layer from each spear. Wash each spear under cold running water to remove any grit or dirt. In a pot large enough to hold all the asparagus bring the salted water up to a boil. Take the asparagus and wrap in bundles about he size of your fist with kitchen string and trim off the bottoms with a knife to make them all the same length. When the water comes up to the boil place the asparagus bundles in and cook for approx 10 minutes. You will have to test them with the tip of a small knife to see when they are done. When cooked remove the bundles from the pot and immediately place them into a bowl of ice cold water and cut the strings. (add a tray or two of ice cubes to the water). This will help set the color in the asparagus so they keep there beautiful bright green color for serving. You want to make them as cold as possible as fast as possible 1 to stop the cooking and 2 to set the color. Drain the asparagus and pat dry with a clean dry kitchen towel or paper towels. You can store them in a shallow dish wide enough to hold all the asparagus by lining it with a damp kitchen towel and covered with plastic wrap. You can make the asparagus early in the day and store them for use later in the day. You can at this point use the asparagus to serve with a simple vinaigrette or one made with fine herbs. Do not serve them ice cold from the fridge, they should be cool not cold. To warm, remove the asparagus from the fridge and place in a steamer basket over boiling water. Warm for a few minutes until hot then remove the asparagus directly to the serving platter or plate up individually for each guest. Spoon 2 - 3 msk. (2-3 tbls.) of the Sauce Maltaise over each portion and serve immediately. If you are serving the asparagus on a serving platter. 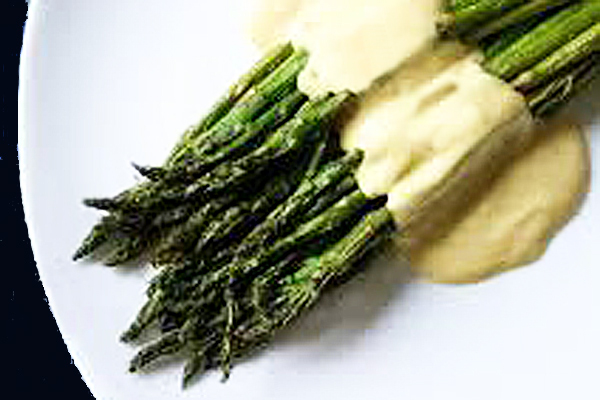 Place the sauce in a warm sauce boat or bowl and place all the asparagus on the serving platter (artfully). Sprinkle with a little very finely chopped parsley or chives and serve immediately. Do use warmed plates at the table. 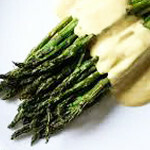 I love asparagus with Hollandaise and really can't get it often enough. A little out of style just now it has bee removed from most restaurant menus because of all the health food freaks (yes I hate them if I should give up Hollandaise). Since the first time I had this I have been hooked. If a host serves this to me it can only mean one thing, they still care abut the classics. Living up here in the north we do get some pretty nasty asparagus imported from all over the world. To add insult to injury they really like to charge for it as well. I don't mind paying for it but only if its good and in season. I can live without it most of the year to really enjoy it when it's time. The season for asparagus in Europe is late May when you can find fine pencil thin asparagus to mid July when they are thicker and 4 or 5 spears are enough for a portion. The season for white asparagus is the same. I think that the best come from England and France but we have when the time is right very good asparagus here as well from about the second week in June. Extremely early asparagus (early March) come from Spain and are grown in greenhouses. We do have Swedish greenhouse grown asparagus very early as well and the ones for sale have looked as if they were harvested in late july. That can't be right but they are there. No - I think that asparagus are one of the really beautiful things in life and I am perfectly willing to live without them out of season and try and eat them almost everyday when they are. Look for green unblemished spears and tips. The bottoms of them should not be all dried out, wrinkled and looking like they have been sitting around since last summer. The bottoms should still be moist and fresh looking. Much has to do with it's handling and storage during transit and at the market where you purchase it. Choose spears of the same thickness so that they will cook evenly. Avoid asparagus in pre made bundles as there are always several that have lost their tips or are completely different sizes. The growers and market do this to even out their losses. I always peel my asparagus if they are any thicker then 1 cm. (3/4 of an inch). I don't bother with all this silly breaking off the bottom 1/3 and cheffy stuff. I peel them and get as much of the spear as I can to eat. I can be rather greedy when it comes to asparagus. I trim off the really course bottoms after that I bundle them up for cooking. The cooking method above is the one I like best. You can of course steam them but if they are not the freshest steaming seems to accentuate that fact. The cooking time is an approximation, you need to test them with the tip of a small knife every couple of minutes to be sure. Very thin spears will of course cook faster then late season thick spears. The most important part though is that they should be just cooked (individual tastes constitutes "cooked"). I like them firm but not "al dente", they should not crunch when you eat them. I hate them overcooked, limp and soggy. You should be able to hold one in your hand buy the bottom and it should want to stand almost straight up. The second most important thing and this is aesthetic, is the ice water. You need to do this to set the color so when you present them they have the most beautiful fresh color possible. Most green vegetables benefit from this process. There are lots of good ways of eating asparagus, the cooking method is the same. I list some of them here. Sauce Mousseline also known as Sauce Chantilly which is Hollandaise with 1/3 the amount whipped cream folded into the warm Hollandaise. Sauce Vinaigrette a la Creme (vinaigrette with heavy cream and fine herbs or try only using dill. Try a thin mayonnaise with fine herbs. For a 120 ml. (half a cup) of vinaigrette or mayonnaise use 2 tbls. of the following finely chopped. Fine herbs constitute a combination of 2 or more of the following. Finely chopped tarragon, parsley, chervil, dill.